Now you can enjoy the highest quality, most flavorful olive oils in the world, along with rich balsamics and finishing sauces, shipped directly to your doorstep four times per year. Never run out of the savory pure ingredients that make all of your meals delicious. 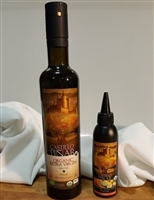 Subscribe today to our Castillo de Pinar subscription packages and receive pure organic extra virgin oil, infused aged balsamic vinegar reductions, and vibrant peri peri finishing sauces. You may cancel or change your plan at any time. Plus, receive a free olive oil mister when you subscribe – the Castillo de Piñar Olive Oil Mister allows you to apply olive oil to the food you are preparing with greater control over the rate and quantity. It is attractive, durable, convenient to use, and easy to clean and refill. Our bottles are shipped in chambered air bags to greatly reduce the chance of breakage, however if this occurs, simply email photo of damage, and we will gladly replace the product.